'S e prìomh-bhaile Bheinin a tha ann an Porto-Novo, ainm eile: Hogbonou neo Adjacé. Tha e suidhichte ann an ear-dheas na dùthcha aig an Gulf of Guinea, aig 40m os cionn ìre na mara. Mar sin dheth tha port-mara cudthromach aige. 'S e seo an co-chomharran aige: 6° 28' Tuath agus 2° 36' Ear. 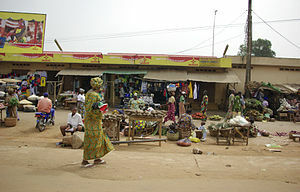 Tha Porto Novo 25km air falbh bho Chontonou, 131km bho Lomé (Togo), 614km bho Abuja (Nìgeiria), 784km bho Niamey (Niger) agus 796km bho Ouagadougou (Burkina Faso). 'S e an dàrna bhaile as motha a tha ann am Beinin. 'S e Cotonou am baile as motha agus as cudthromaiche a tha ann, o choinn's gu bheil an riaghaltas an sin. Canar gun deach Porto-Novo a stèidheachadh anns an 16mh linn leis an rìgh Te-Agdanlin à Allada. Thàinig ainm a' bhaile às a' chànan Portagailis, tha e a’ ciallachadh “port ùr”. Chaidh Porto-Novo a chleachdadh mar àite-malairt le tràillean. Porto Novo Museum of Ethnography, Taigh tasgaidh dualchas le mòran fiosrachaidh mu eachdraidh a’ bhaile agus eachdraidh Bheinin. Luchairt King Toffa, 's e taigh-tasgaidh a tha ann an-diugh, a’ sealltainn dòigh-bheatha nan rìghrean Afraganach. Jardin Place Jean Bayol àite le clach-chuimhne den ciad rìgh Porto-Novo. Da Silva Museum, taigh tasgaidh a tha a’ sealltainn eachdraidh Bheinin agus dòigh-bheatha nan Afro-Brazilians, a thàinig air ais gu Porto-Novo. Palais de Gouverneur, lùchairt luchd-riaghlaidh. Air a tharraing à "https://gd.wikipedia.org/w/index.php?title=Porto-Novo&oldid=520811"
Chaidh an duilleag seo a dheasachadh 17 dhen Lùnastal 2016 aig 12:17 turas mu dheireadh.